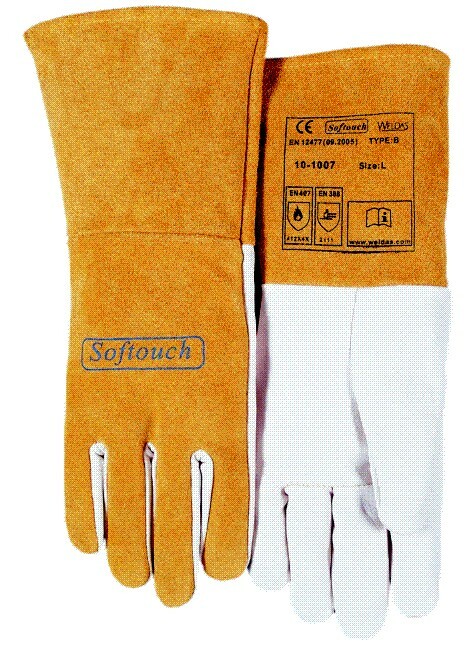 SOFTouch™ grain lightweight goatskin welding glove with split cowhide cuff. Seamless index finger for better feed of TIG wires. Weldas® TIG gloves (10-1003, 10-1005, 10-1009, 10-1050) have a “seamless” index finger construction. This provides unobstructed control over small diameter welding rods and ultra light TIG torches. This design also minimizes the seam burn out and abrasion. Hand made of goatskin. Very soft and excellent feeling. Cuff made of split cow leather. Seamless index finger.